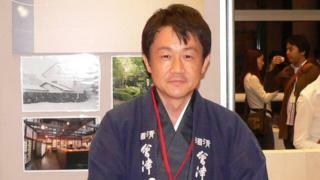 Mr Karahashi, owner of the Homare Sake Brewing Company in the Fukushima prefecture, the region where the stricken nuclear power station is located, says the callers are all concerned about radiation levels. "One of them told me that he received our sake as a gift from his friend, but he did not want to accept it," says the 41-year-old. "He asked me if he could return the bottle to us. I told him to discard it if he would not drink it, but he said it would contaminate his place to do so." Mr Karahashi adds that many more Japanese shoppers simply won't buy any sake - an alcoholic drink made from fermented rice and water - from Fukushima. "They do not openly say they will not buy Fukushima's products, but they never buy them," says Mr Karahashi, who is also chairman of the Fukushima Prefecture Sake Brewers' Association. "In that case we do not have the chance to explain to them the safety of our products." For the 62 member breweries of the Fukushima association, there is also little cheer from former key export markets. China continues to ban all imports of sake from Fukushima and nine other Japanese regions, citing continuing radiation fears. And South Korea, which was previously the second-largest overseas market, has simply stopped buying Fukushima sake. Yet at the same time, and seemingly paradoxically, sake experts say that the Fukushima nuclear accident has been good for Japan's wider sake industry, which is predominantly made up of small companies. They say the radiation scare has made Japanese drinkers more concerned about the origin and quality of their sake, which in turn has led to an increase in sales of more expensive, premium versions of the drink. The Fukushima Daiichi nuclear disaster that began on 11 March 2011 saw three of the six reactors at the facility on the east coast of Japan go into meltdown after a tsunami caused by an offshore earthquake destroyed their cooling systems. Before the situation was brought under control a significant amount of radiation was released into the atmosphere. The problem for Fukushima's sake producers is that consumers fear the fields of local rice harvested to make their drink, or their water supplies, may have been contaminated. Despite them all being way outside the exclusion zone surrounding the nuclear facility. Mr Karahashi is quick to say that officials from the Japanese government continue to test all the raw materials and final products of the association's members, and that they get a clean bill of health. Yet buyers are still cautious both at home and in neighbouring countries. For the wider sake industry in Japan, and its 1,250 breweries, the Fukushima disaster could not have come at a worse time. Despite still being considered the country's unofficial national alcoholic drink, its share of the domestic market is actually very small. Seen as old-fashioned by many consumers, particularly among the young, sake represented only 6.5% of all alcohol consumed in Japan in 2013, according to official figures, down from 6.7% the previous year. Since the 1970s Japanese drinkers have instead increasingly switched to beer, wine and whisky. Yet at the same time as overall domestic sake sales are falling, those of premium versions - such as sake made with better quality rice and no additives - have risen strongly, increasing by 14.8% in 2013. Tokyo-based sake expert and writer Rebekah Wilson-Lye says this is a result of the Fukushima disaster. "What I observed, as a Japanese resident, was that after the disaster the radiation scare focused people's attention on the origin, cultivation and safety of the product they were consuming," she says. "In the years following the disaster we are seeing much more sake made with regionally grown organic, or low pesticide rice. "[And] a growing number of brewers are starting to cultivate their own rice - something which I believe has a direct correlation to the heightened concerns over food safety post-Fukushima." Yuichi Hashiba, the owner of the Izumibashi Brewery in Kanagawa near Tokyo, is one such sake brewer who grows his own rice, and also only makes a higher grade of the drink. To raise awareness of his product, he invites local people to help with the rice harvest. In return he treats them to a celebratory feast of grilled fish, and sake from previous harvests. "When I was growing up, the image of rice growers wasn't cool," says the 46-year-old. "Allowing people to learn hands-on how rice is grown helps change that image, and lets them feel the blessing of nature." Such is the domestic demand for Mr Hashiba's sake - which sells for up to 5,000 yen ($43; £28) a bottle - that he exports only 2.5% of what he produces, mainly across the Asia-Pacific region. For other sake producers, exports are a more significant part of their sales, with the US being the largest overseas market. And while China and South Korea may be nervous about buying Japanese sake following the Fukushima disaster, sales to the US and Europe have continued to rise every year. Antony Moss, who teaches courses on sake at the London-based Wine and Spirit Education Trust, says that British lovers of the drink are still more than happy to buy Japanese sake, including bottles from Fukushima. "My impression is that, typically, British customers tend to trust their own government, and the Japanese government, to avoid putting them at risk," he says. "So any sake that has made its way to the UK is not regarded with suspicion, even if it comes from the Fukushima prefecture."